Loner Lila Waters had never met a man as fascinating as her new employer. Dashing and charismatic, yet also brooding and distant, Samuel Bashir awakened the hungry, loving woman within her. But too many clues–and the darkness that seemed to surround him–hinted at a mystery that could break her heart. 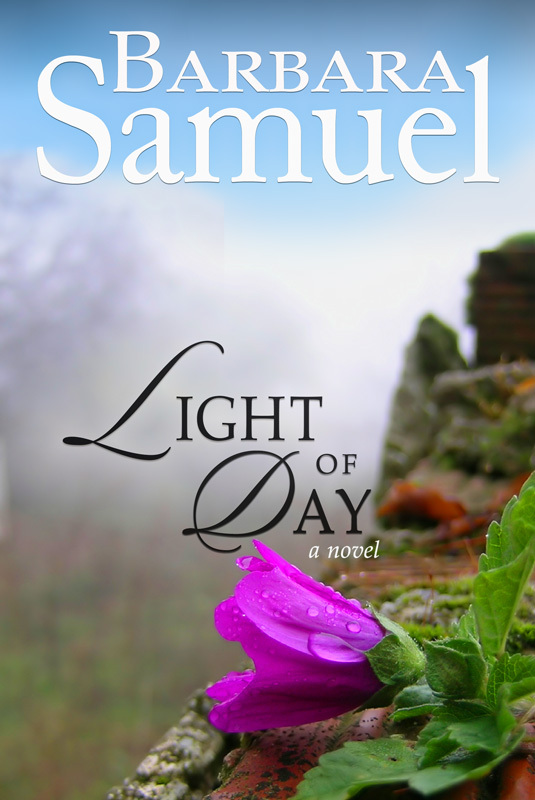 Years of being on a dangerous secret “mission” were gnawing at Samuel, leaving him empty, except for an aching desire for Lila. But she was a creature of light, of shimmering passions, while he moved among the shadows. He could offer her nothing but pain. Still, her poignant radiance tugged at him, daring him to dream the impossible–that their love could find its place in the sun…. The car rumbled up next to Lila, a beautiful old Mercedes, black, with modest fins at its tail and a smoothly purring engine. It gleamed like polished glass in the silvery light of the overcast day. She’d loved the model since childhood, when the wife of a rich neighbor had driven one home from Dallas. Only after she’d admired the car in all its detail did she notice the man behind the wheel—and he startled her. The lines of his face were as spare as those of his automobile. Harsh, slanting cheekbones cast shadows over the lean flesh of his cheeks. A broad, high forehead met straight slashes of brows even darker than the heavy black of his hair. His nose would have overpowered another face, but on this man, it was the only possible nose to balance the square, hard chin. Lila grinned. If she’d been one to admire severe and arrogant men, he’d have been a prize. Instead, she thought he looked in need of a little whimsy to chase the scowl from that intelligent brow. She flicked her wrist on the accelerator of her bike, revving the engine of her motorcycle into harmonious vibration with the car. He still didn’t notice her next to him, so with a toss of her head, she whistled, loud and long, in admiration of the car. Black eyes, fathomless without the mark of a pupil, met hers. Lila felt her heart do an odd thump, and was suddenly thankful the helmet she wore hid most of her face. He lifted his chin in the slightest of acknowledgments, and Lila saw there was danger in his eyes—danger and power, and something else she couldn’t even name. An impatient honk sounded behind her, and Lila glanced, startled, at the traffic light. Seeing it had turned green, she let go of the brake and pulled ahead easily. It was impossible to resist one peek in her rearview mirror at the man in the finned Mercedes. Maybe, she thought as her heart thudded, there was something to be said for that darkly elegant type, after all. A light rain had begun to fall from the Seattle sky as she pulled into the parking lot of The Shell and Fin, an elegant seafood restaurant she’d formerly managed with some success. A year ago, unable to placate the alcoholic owner, she’d quit to become a free-lance dessert maker, and now she sold tortes and other rich delights to them. Rather than clip the helmet under the seat as she ordinarily would have, Lila dashed for the kitchen door to the restaurant. She hoped the storm would blow over. The Pacific Northwest boasted a great many advantages, but the weather was definitely not among them. One day she’d give in and buy a car. Lila glared at the retreating back. “Good riddance,” she murmured to herself. Georgia had never been the best employee. Hired in an emergency, she’d managed to hang on to her job only through a kind of dogged ingenuity. But half the crew? Who else was fired? And who’d done the firing? “What’s going on?” she asked the cluster of people around the steam table. With a ripple of intuition, Lila knew before she turned that the precise diction and lilting accent would belong to the severe man in the Mercedes. Embarrassed but determined not to show it, she swallowed a smile and turned. The black eyes caught her hard where she stood, knocking the amusement from her chest like a bullet. He stood just inside the door to the dining room, possessed of the kind of long-bred elegance found only in the children of wealthy fathers or in men who’d striven to overcome their beginnings. As Lila measured him, she couldn’t decide which he might be. As he turned to lead the way to his office, Lila shot a quizzical glance at the other women. Charlene shrugged. She settled in a functional, vinyl chair and folded her hands, waiting. He rounded a heavy walnut desk, smoothing an errant lock of hair from his forehead as he sat down. Behind him rain slapped with gray fury against the windows that looked toward Puget Sound. He didn’t speak for a moment, and Lila found herself uncharacteristically nervous. He wasn’t a particularly large man, but in the small confines of the room, behind a closed door, she felt again that ripple of danger. Which was ridiculous, she decided sensibly. Severe didn’t mean dangerous. She realized that he had a generous mouth between the hawkish nose and solid shelf of chin. He didn’t look cruel, as she had imagined at the traffic light. “I’m not able to,” she said firmly. It still hurt to say that about anything, but in this case it was true. Samuel nodded, his eyes intently taking in her face and clothing. “Gerald warned me that you might feel that way.” He made a clicking sound with his tongue. “All right, then.” She stood, brushing hair away from her face. He stood, as well, rounding the desk to open the door for her. He paused, his hand on the doorknob, a sudden glitter lighting his black eyes. “Thank you, by the way,” he said, inclining his head in a peculiarly European fashion. At that, she almost found herself flustered. Then she lifted her eyebrows and shrugged. “I’ll see you later,” she said, and escaped into the comforting noise and bustle of the kitchen. Samuel watched her go. Her dark curls spilled over the shoulders of her worn flight jacket, and a silvery scarf trailed down the back. Not what he’d expected from the reports, he thought as he closed the door. The Lila Waters in the personnel files left short, professional notes about employees and dashed off quick memos about particularly successful menu combinations in the scrawl of a busy woman. He’d expected someone tall and brisk and polished. Instead, Lila Waters looked more like her name, like a gypsy camped on a lake or a Bedouin in the desert—all scarves and jewelry and flashes of color. He smiled to himself, thinking of the mirth in her dancing green eyes, which she’d tried to quell. What pleased him was that she’d not quite been able to erase it. His smile faded as he looked toward Puget Sound. Not for you, Samuel, he thought. Not ever for you. The rain had let up for most of the evening, but naturally, as soon as Lila headed back to the restaurant for her late meeting with the new owner, it started again. Not a downpour, just a steady wet drizzle, but it was enough. By the time she pulled into the parking lot of The Shell and Fin, she was miserably cold and irritated. Reaching into the saddlebags on the bike for a change of clothes, she gave herself a lecture. “Stupid, Waters, that’s it. Haven’t you carried this on long enough? Just buy a car and keep the bike for summer days, like normal people. You’ve proved what a big, brave woman you are. Now show everybody you can use your brain for something besides keeping your ears apart.” Clutching the bundle of clothes to her chest to keep them dry, she hurried up the steps to the back door of The Shell and Fin for the second time that day. In the changing room, peeling off layer after layer of dripping fabric, she made a resolution: a car, tomorrow. At twenty-two, she’d desperately needed to make a point to her overprotective family about her hunger—despite her back problems—to be a strong, independent woman. At twenty-nine the need to be comfortable had taken top priority. It looked as if he was going to get the raw Lila instead. Since there was little she could do about it, she tucked her long-sleeved blouse into khaki slacks and went in search of him. All afternoon, as she’d whipped coconut-pecan filling for cheesecake, sliced peaches for a tart and pressed her special mixture of graham-cracker crumbs into pie pans, she’d felt him whispering around the edges of her mind. She didn’t dare put his name to him. Just him. Men didn’t rattle her ordinarily. Nothing rattled her, not after the continual, exhaustive pranks of seven brothers. Nothing, that is, until Samuel Bashir had muttered his teasing thank you this afternoon. Business, she thought. That was the thing. He was the last chance for The Shell and Fin, and she owed the restaurant that had given her a home for seven years at least that much consideration. The kitchen was empty except for a teenage dishwasher scrubbing the last pans. The office door stood open, but the room was empty. She finally found him in the dining room at a table overlooking a magnificent view of the Sound through tall fir trees. Around the black edges of the water, lights flickered in rain-blurred beauty, a view that had always left Lila speechless. Inside, on a white linen tablecloth, a single candle burned against the night, supplemented only by muted spots along the walls. Samuel Bashir sat with his back to her, smoking and staring out the window, at a table set with a heavy white cloth and fine china. A bottle of chilled wine rested in a bucket near his elbow. Through the speakers discreetly set in the ceiling, classical music of a dramatic nature played softly. Elegant men, pressed and well coiffed, had always seemed to Lila to be slightly effeminate. No woman in her right mind could say that about this man. In his relaxed pose she still sensed an aura of restlessness and danger, an impression she couldn’t quite shake, though she also couldn’t decide what made her feel it so strongly. She thought again that restaurants seemed a tame occupation for him, but brushed the notion away as unworthy of her. Power, after all, could be exercised in many ways. “My mother is a Frenchwoman. I spent some time there as a youth.” He leaned forward to lift the dome of a covered dish, revealing casserole of cod, tomatoes and herbs, topped with tiny fried triangles of French bread. It was a country dish, a favorite with the customers and one of Lila’s preferred meals. He inclined his head, a very small smile showing the long lines around his mouth. “Allow me,” she said, picking up the serving spoon. Samuel laughed with her as she ruefully lifted a stand of curly hair as if to illustrate her words. In the candlelight her light green eyes held almost no color against sweeping dark lashes. Not a hint of makeup marred the fresh, clear features, and he found he didn’t mind. Even her lips, washed clean by her motorcycle ride, needed no assistance, for they were watermelon ripe and pouty and full. A mouth a man would not want a woman to paint, for even unadorned, it was impossible to avoid imagining the taste of it. Samuel nodded, stubbed out his cigarette and took up a sheaf of papers, signaling the start of their business conversation. For well over an hour, Lila made explanations of her choices in liquor and food distributors, gave overviews of customer preferences in menu specialties and price ceilings. Samuel asked pertinent questions in his liltingly accented voice, listening carefully to her answers, making notes on her recommendations. He asked about the dynamics between the kitchen and the floor, probed the needs of the employees and their expectations, as well as those of the customers. “Definitely.” Lila nodded, impressed in spite of herself. Health insurance? Profit sharing? Despite changes in the restaurant business the past few years, such programs for employees were still rare. It surprised her that a man who seemed to be such a rigorous and ruthless businessman should also show consideration for employees. Perhaps, she decided, it was nothing more than good business sense, a quality she thought he had in abundance. If the employees were well satisfied with their positions, after all, day-to-day operations would likely proceed with greater harmony..
“Not really.” She frowned as she mulled over the time and energy involved in the task, then named a figure she thought was fair. As he led the way to the office, he added a certain courage to his mental assessment of her, an assessment that was already rather confusing in its opposites. Lila tried to control her legs as she trailed him into the small office, taking a chair before he could turn. Even when she was sitting, a series of muscle spasms in her lower back sent an excruciating radius of pain up to her shoulders and down through her legs to her toes. She breathed in slowly, consciously relaxing every atom of her body, then let go of the breath just as slowly. There was no controlling the spasms, but there was a way of living with them. She glanced up to see Samuel’s black eyes on her, not with the impatience she often encountered, but with something very like admiration. “It’s your back that prevents your working,” he said. The consultation was over, Lila thought, accepting a stapled sheaf of papers. Now, the only thing was to stand and go. She steeled herself to rise from the chair gracefully. Ah, there, she thought. The grip eased, and she stood up. “I hope I’ve been able to help you,” she said, extending her hand. He took it in his, and Lila noticed his hands were brown and hard and long fingered, his grip cool and professional. “Thank you for coming,” he said formally. She paused, her hand on the doorjamb, and flashed him her dazzling, daring grin. “I’m stronger than a stray dog,” she said, and left.